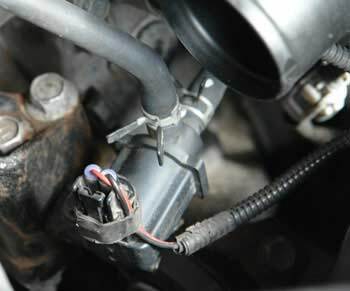 In many cars, including VW, Audi, Nissan and Mazda, a bad purge valve is the most common culprit for the code P0441. The purge valve (it could also be called purge solenoid) can be purchased from a dealer. Usually it's not very expensive and easy to replace. Often when the charcoal canister starts failing, the charcoal pellets are drawn into the purge line and clog-up the purge valve or the purge lines. If a lot of charcoal pellets are found stuck inside the purge valve, the charcoal canister might also need to be replaced. In many late 90-s, early 00's Toyota and Lexus vehicles, there is an EVAP VSV valve and vacuum hoses at the charcoal canister that need to be tested. Often, it's the VSV that goes bad or one of the vacuum hoses gets clogged up with charcoal pellets from the canister. Unfortunately, Toyota sells the EVAP VSV valves as one unit with the canister, which is quite expensive, but we found the VSV valves available separately on Ebay and Amazon. Either way, all vacuum hoses connected to the EVAP VSV valves must be replaced and vacuum metal lines must be tested for blockage and cleaned. The Toyota technical service bulletin (TSB) dated 2003, also mentions the inoperative Canister Closed Valve Vacuum Switching Valve (CCV VSV) as the possible reason for the codes P0441 and P0446. The CCV VSV must be tested and replaced with an updated part if inoperative. In 2002-2007 Dodge and Chrysler vehicles, the NVLD unit is fairly common to fail and causes the code P0441. The Evaporative System (EVAP) catches the gasoline vapors escaping from the gas tank and stores them in the charcoal canister. When the engine is running and other conditions allow, the vapors are purged into the engine and burned along with the air/fuel mixture. The engine computer controls the amount of purge flow by gradually opening or closing the purge valve. The actual amount of purge flow is typically monitored by the EVAP pressure sensor, as well as a number of other sensors. If the actual amount of the purge flow is different from what is expected, the engine computer determines a fault and stores the code P0441 Evaporative Emission Control System Incorrect Purge Flow. This could mean, for example, that there is a purge flow when the purge valve is supposed to be fully closed or there is no or limited flow when the purge valve is open. The purge valve is typically electrically powered. 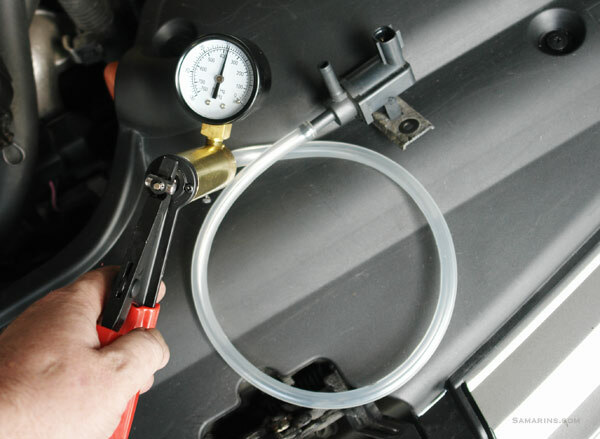 You can find the procedure to test a purge valve in the service manual. In most cars, the purge is fully closed without voltage. 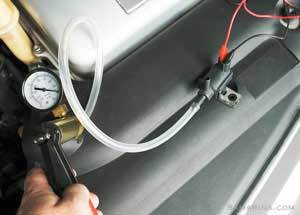 In this Toyota, for example, the purge valve is tested with a vacuum gauge (in the photo). The vacuum pump with the gauge is connected to one side of the valve. When the vacuum is applied, the purge valve should hold the vacuum and not leak. If the vacuum drops (the gauge needle moves), the purge valve is leaking and must be replaced. When the battery voltage is applied, there should be an audible click and the purge valve should be fully open. This purge valve is OK. Read more about the purge valve ».